Bed Grading | Catalyst Bed Grading | Active Bed Grading - Eurecat U.S. When looking for void space grading material exceptional structural integrity and maximum void space fill are a must. Eurecat's Guardian™ bed grading material line offers exceptional performance and maximum value in its inert T5, NR/CR hollow cylinders (rings), and NT/CT 1/10" tri-lobe extrudate bed grading materials. Guardian™ provides a much lower cost for hollow cylinders (rings) and 1/10" extrudates from with savings as much as 50% compared with "fresh" rings and extrudates. 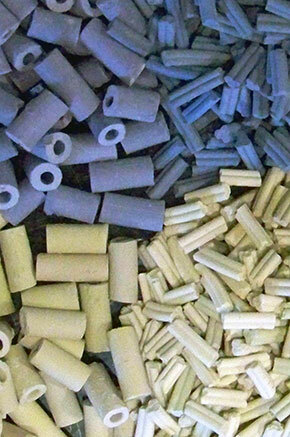 Guardian™ is manufactured using clean regenerated catalyst as its raw material. Guardian™ is an ideal choice for those hydrotreating units needing a standard size and activity grading at the top of the catalyst bed.